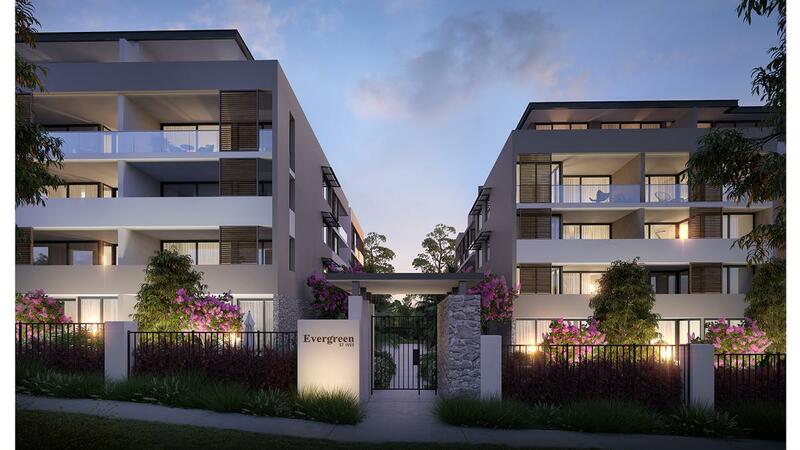 Evergreen is St Ives newest apartment buildings in the sought after Village precinct area of this highly desired Upper North Shore locale. Enjoy a peaceful retreat in this exclusive suburb, with seamless light–filled spaces designed for relaxing, entertaining and easy family life. Premium natural finishes, exceptional detailing and abundant storage offer timeless elegance and a practical sense of home, Evergreen is designed for the owner occupier seeking the ideal location, security, design and finishes with apartments offering a wide range of amenities, outlook. Evergreen offers a unique mix of stunning contemporary light filled apartments, clean lines with a subtle tone-on-tone colour palettes offering something for everyone, with considered efficient layouts and generous proportions. Designed by award Marchese Partners, these apartments reflect a genuine understanding of style, liveability and respect for their special St Ives surrounds. Approximately 500m level walk to St Ives Shopping Village, Evergreen is close to public transport and North Shores enviable amenities, Evergreen offers unrivaled convenience. Located in the catchment zone of many top ranking primary and secondary state schools, and surrounded by many of Sydney’s best private schools the options are endless. There is also easy access to many Universities in Sydney. Inspired by Marchese Partners and PTG Australia Investment who have a strong track record of delivering quality residential projects and exceeding buyer expectations.